I rushed home from two meetings, noodle lunch with a friend and a brief diversion into Armani Exchange. We were having another Friday night dinner party. Where I would cook an Indian meal in wild panic, shower and look relaxed just in time for the doorbell. Normally, I am star of the show at these evenings. But this time, our neighbour's 60-something young mum stole my thunder. We made caipirinha. Smashed glasses. And doubled up over the Kali Dal, Bhuna Gosht and Aubergine Raita as she regaled us with stories of learning how to drive in Indonesia, growing illegal herbs at home and a chance meeting with Gary Glitter. Eddy, Absolutely Fabulous, we gasped before falling off our chairs and finally calling it a night. Recovered from the evening of curry, I searched my cookbooks for inspiration on Sunday. It had to be Besan Ladoo a ghee-laced, sugar-soaked, decadent Indian sweet. Tipped as a great snack for children, by a mum in one of my cookbooks. Strange, that. I'm no expert, but to me they're the sort of thing that you'd give your child if you wanted them to fly around the room at midnight. But then again, wouldn't life be rather dull without unconventionally fabulous mamas? Crush the pistachios and cardamom. I used my coffee grinder but you could just smash them up in a mortar and pestle. In a small non-stick pot, bring half the ghee to heat over a low flame. When it is warm, add the besan and stir well mixing it in. Keep adding the rest of the ghee bit by bit and then stir in the sugar, ground pistachios and cardamoms. Now stir this mixture well for about 20 minutes until the raw smell of the besan disappears to fill your kitchen with a glorious aroma. Leave the mixture to cool slightly. When it’s warm enough to handle, fashion little balls out of it and leave to set in your fridge until cool and hard. Store in an airtight container and keep them all for yourselves! I was being a good girl and following a strict calorie-controlled diet and exercise regime for 10 days. And then I saw this post. I want to make this too but I have never bought ghee – it always seems to be in big pots. Is it better to try to make my own ghee? And is there a “quick” way to do so? Your blog made me smile and three cheers for 60+ women having fun – beacons lighting the way! LOl..moms usually “time” the sweet snacks…unless they’re crazy of course. Sweet snacks are at 3pm..eat and go crazy in the backyard. haha….fly around the room at midnight!! that is a fabulous line….and rings true too!! laddoos look lovely!! LLL!! Dude-ette, you are no good for women who are trying to eat fewer sweets! My mum used to make the most delicious besan ladoos when we were kids. I wonder if these are like those?! “Sugar laden sweets”, I agree. I don’t buy any sweets from Indian store. They are always sweet beyond my imagination. Homemade, we can aways control how much we add. Sounds super yummy to me! Count me in for a few at midnight! Maybe an espresso too! Fun evenings with great food! What more could you ask for!!!! Yummy, yummy, yummy! Whenever you can, could you share with us your thoughts on the aam kheer recipe in “The Calcutta Kitchen”? I tried it this weekend, came out pretty well, but I’d love to see what better things you can do with it. Never tried this before but looks good to me!! 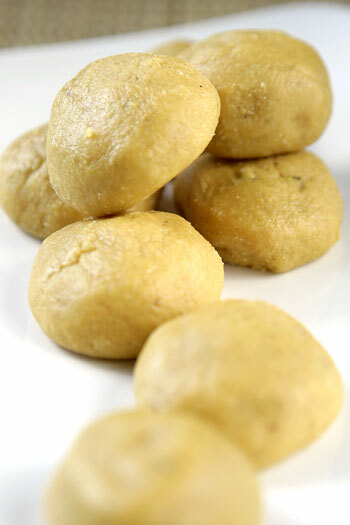 My Husband loves Loddo so much and thanks to sharing this easy way to make Besan ladoo.